Innovative nanostructured treatments for stone conservation, based on dispersions of photoactive TiO2 nanoparticles, recently studied in our research group, provided interesting results after laboratory testing. Unfortunately, it is almost impossible to accurately reproduce in the lab the complexity of field exposure conditions. It is then of crucial importance to evaluate the behaviour and durability of new treatments in situ, once they are applied to real deteriorated surfaces of the architectural heritage exposed in outdoor. In the present research, the effectiveness of a TEOS-nano-TiO2 treatment and of two nanocomposites based on nano-TiO2 dispersion in organosiloxane and functionalized SiO2 for the protection of two specific marbles—Candoglia and Crevoladossola—has been evaluated on-site. The effect of the introduction of innovative titania nanoparticles in selected commercial products has been examined focusing on compatibility and protection efficacy in real exposure condition. An on-site testing protocol has been defined and carried out for 12 months after the application, considering colour and morphology changes and water absorption by capillarity. The nano-TiO2 addition does not hinder the performance of the protective treatments while it provides a positive contribution in soiling reduction. The results will be implemented in the operative framework of the ongoing conservation project of the considered historical façade. Soiling, condensed water, atmospheric pollution and biological attack are among the main responsible for stone deterioration in urban environment , since they can affect the materials of architectural heritage from both the chemical and the aesthetic point of view. The application of surface treatments can shield the stone surface, reducing and preventing the interaction with these degradation agents . The treatment of very low porous stones, such as marbles, is challenging since the applied products can hardly penetrate into the material and generally show poor adhesion to the substrate, thus affecting their performances . Acrylics and partially fluorinated acrylics, perfluoropolymers, siloxanes and silanes are the main classes of polymeric formulations used in the field of stone protection [4–6]. In addition, inorganic protective treatments, such as protective oxalate and sacrificial lime layers, were developed since they show higher compatibility with the mineral nature of the stone substrate and can provide a better resistance to environmental agents and pollutants [2, 7]. 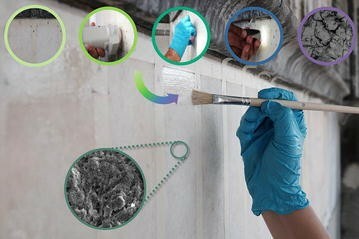 In the last decade, the development of innovative nanostructured materials for the conservation of Cultural Heritage was proposed, displaying enhanced properties and effectiveness compared to traditional treatments, encouraging their use both for stone consolidants [8–11] and protective formulations [12–14]. In particular, due to their photocatalytic properties , TiO2 nanoparticles were used for the set-up of self-cleaning treatments with either hydrophilic or hydrophobic behavior [16–20]. The photocatalytic properties of titania nanoparticles promote the degradation of pollutants from the exposed surfaces, which can be easily washed away by rain. The use of these treatments can be considered a preventive conservation strategy for stone degradation and soiling, leading to a more efficient and cost-effective maintenance of historic buildings. Different stone materials have been treated with TiO2 nanoparticles dispersions or nanocomposites, in order to achieve results which could comply with the strict requirements in the field of heritage conservation (aesthetic compatibility, non-harmfulness, re-treatability, protection efficacy); many experimental studies have been carried out in the last years . However, limited information and data are available on the real long-term performances of photoactive materials, on the release of nanoparticles from building materials in the environment and on their impact on human health. In particular, the durability of nano-TiO2 based treatments has been mainly assessed in laboratory so far. The adhesion of the coatings to the stone substrate has been tested by means of peeling tests [16, 21, 22], while the stability to sunlight and rain wash was studied by means of solar box test and accelerated weathering cycles [20, 23–27]. In addition, in order to evaluate the durability also in outdoor conditions, some field exposure tests of treated stone specimens have been carried out . Laboratory tests for the evaluation of the performances of protective treatments provide valuable information and quantitative data in controlled environments but they are carried out in simplified conditions which cannot fully simulate the complexity of real aged surfaces. Therefore, it is crucial to monitor the effectiveness of such products after the on-site application on architectural stone surfaces in order to thoroughly study their long-term performances. Such a monitoring approach, on the other hand, requires the acquisition of long-term set of data in order to be significant, according to the rate of evolution of the considered deterioration mechanisms. Moreover, the high number of parameters involved in monitoring increases the complexity of the data elaboration and interpretation. This can partly explain why only few examples of application of innovative nano-TiO2 treatments on real surfaces of Cultural Heritage can be found in the literature and the even more limited number of monitoring results available. In the present research, the effectiveness of a TEOS-nano-TiO2 treatment and of two nanocomposites based on innovative solar-light activated nano-TiO2 dispersion in organosiloxane and functionalized SiO2 has been evaluated on-site for the protection of the two specific marbles employed in the façade of the Cathedral of Monza (Italy). These treatments have been recently developed and provided promising results in laboratory [28–30]. The study is particularly focused on the evaluation of the effect of the introduction of innovative titania nanoparticles in selected commercial products for the protection of marble stone surfaces. The façade of the Cathedral of Monza is characterized by the presence of two types of marbles: Crevoladossola and Candoglia marble . 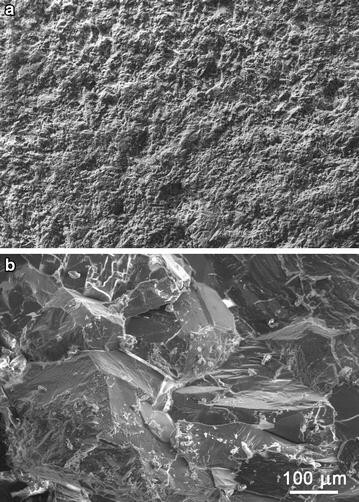 Despite the common carbonatic nature and the similar very low initial porosity, the two marbles reacted quite differently to the prolonged outdoor exposition in the polluted urban atmosphere of Monza: Crevoladossola shows a rather poor state of conservation due to intense surface recession and decohesion of the crystalline matrix; while Candoglia is mainly affected by erosion and soiling, depending on the exposition conditions. The conservation strategy in this case should then aim at two objectives: the protection of the very external and weathered part of the stone surfaces and the reduction of the soiling effect induced by the accumulation of particulate matter in sheltered condition. To fulfill this double aim, two different approaches, exploiting the self-cleaning properties of nano-TiO2-based treatments, were set-up. The first one consists in the application of nano-TiO2 dispersions after a pre-treatment with a surface consolidant (tetraethyl orthosilicate, TEOS), aiming at slightly improving the cohesion of the crystalline matrix, without changing the partial hydrophilic character of the marble surface; the second one consists in the application of hydrophobic nanocomposites . The performances of these innovative treatments have been tested on-site on both Crevoladossola and Candoglia marble and compared to those of selected commercial products. Micro-samples were collected from the façade to characterize Candoglia and Crevoladossola and to assess the state of conservation on-site. Micro-samples were investigated by: Leica M250C stereomicroscope, integrated with a Leica DFC290 digital camera for image capture; Philips PW1830 X-ray diffractometer (XRD) using Cu Kα radiation (λ = 1,54,058 Å), PW3020 generator and Bragg–Brentano geometry; Fourier transformed infrared spectroscopy (FTIR) using a Thermo Nicolet 6700 FTIR spectrometer in KBr dispersion with a DTGS detector in the spectral range 4000–400 cm−1; environmental scanning electron microscopy (ESEM) and energy dispersive X-ray (EDX) analyses, using Zeiss EVO 50 EP ESEM, equipped with an Oxford INCA 200—Pentafet LZ4 spectrometer. Porosimetric analyses were performed on fresh Candoglia and Crevoladossola specimens from quarry by means of a Micromeritics AutoPore IV 9500 mercury intrusion porosimeter. Candoglia and Crevoladossola marble surfaces of about 85 × 55 cm and 138 × 70 cm, respectively, were selected for the application of the treatments in a pilot-area on the façade of the Cathedral. The stone surfaces were cleaned before treatments by controlled micro-sand blasting (CTS 6 micro sand blaster, CTS srl) with a 0.7 mm nozzle and a working pressure of 2 bar, using garnet (GMA Garnet 120 mesh) as abrasive. For each block surface, seven similar areas were defined and treated with the materials listed below, while an area was left untreated as reference. Transparent water dispersions of pure anatase TiO2 nanoparticles (3% by weight, nanoparticles size around 40 nm), synthesized according to the non-aqueous route , as reported in previous papers [28, 33], were used to set-up the innovative treatments. Nanoparticles showed high stability once dispersed in water and no aggregation occurs. The photoactivity range of nano-TiO2 is extended to solar light radiation in addition to UV light as a result of the residual presence of benzyl alcohol groups, which derive from the specific synthesis and are anchored to the surface of the nanoparticles. a nanocomposite prepared by adding water dispersion of nano-TiO2 in a solution of SiO2 functionalized by silicon alkoxides in isopropyl alcohol (SIOX-5 S®, Siltea srl), with nano-TiO2 concentration in the functionalized silica of 16% by weight. The treatments were applied by brush on the clean and dried stone surface in order to cover it entirely with a single layer [28, 30]. The amount of applied products determined by weight before and after the application (mg/cm2) is reported in Table 1. The differences in the applied amount are related to the specific surface absorption features, the substrate texture, porosity and state of conservation and to the viscosity and surface tension of the products. In order to evaluate the effectiveness of the treatments, a diagnostic protocol of tests was carried out before the application and about 1, 4, 7, 10 and 12 months after the application. The first post-treatment monitoring step was performed after 1 month to allow the complete curing of TEOS and TEOS-based treatments. Colorimetric and water absorption test were replicated three times on each area to tackle the intrinsic heterogeneity of the stones with respect to the microstructural features and the non-homogeneous deterioration patterns. Optical microscopy observations were carried out using a portable digital microscope Dino-Lite Premiere AM7013MT, colour CMOS sensor and white LED illuminator. VIS spectrophotometric measurements were performed by VIS spectrophotometric measurements with a Konica Minolta CM-600D instrument with a D65 illuminant at 8°, wavelength range between 400 and 700 nm. 25 measurements were carried out on each testing area after mild brushing of the surface in order to remove the deposit due to the pilot site activity. Data were elaborated according to the CIE L*a*b* standard colour system . Non-invasive water absorption measurements by contact sponge method were carried out using a contact sponge kit (CTS srl, Italy). The measurements were performed according to the standard protocol : the sponge was soaked with a 5 ml deionized water syringe and put in contact with the stone surface for 2 min. The sponge mass variation after the contact was measured on-site by a portable Entris 153-1s balance with 1 mg of readability (Sartorius srl, Italy). The water absorption results are reported only for Crevoladossola marble, since the initial absorption values of the untreated Candoglia marble were under the mass detection limit of the balance for in situ measurements. The measurements of water absorption are strongly affected by the weather conditions. Therefore, the average hourly data of temperature (°C) and relative humidity (%), recorded by ARPA (Regional Agency for Environmental Protection) in the nearest atmospheric stations during the monitoring periods are reported (Table 4) in order to better compare the absorption data obtained in different climatic conditions. 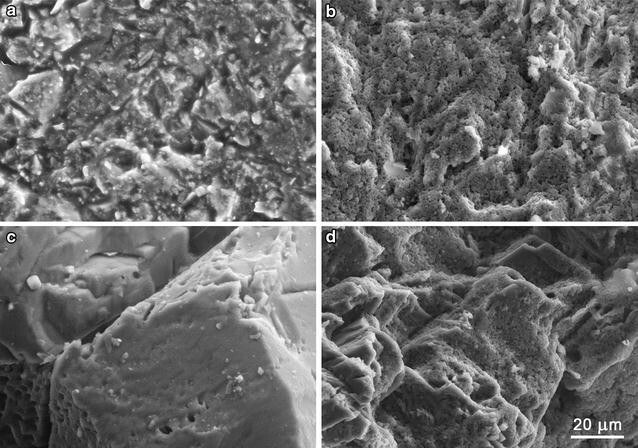 Finally, stone micro-fragments were sampled from untreated and treated areas of both Candoglia and Crevoladossola marble blocks and analyzed by ESEM-EDX with the above reported instruments. Candoglia marble has a medium to coarse-grain size and a rather light pink colour, with dark-grey layers due to the presence of subordinate silicate minerals and it has been traditionally used in the construction and maintenance of the Cathedral of Milan [36, 37]. Crevoladossola marble is a fine grained dolomitic marble which was used in different historical buildings in Northern Italy such as “Arco della Pace” in Milan and the Cathedral of Pavia [36, 37]. The main mineralogical, compositional and porosimetric features of Candoglia and Crevoladossola marble are summarized in Table 2. Candoglia marble shows calcite as the main mineralogical phase with some minor quartz. Gypsum and nitrates detected by FTIR spectroscopy in the superficial areas of the samples are due to environmental contamination whereas no significant signs of chemical alteration of the substrate (sulphation) are observed. The same applies to Crevoladossola, which is mainly constituted by dolomite with phlogopite mica as accessory mineral. Both stones are characterized by very low initial porosity. The values obtained from freshly quarried samples reported in Table 2 are around 1% total porosity, which indicate a compact stone matrix and determine a low water absorption capability. This aspect represents a critical factor with respect to the stone treatment as it may prevent the penetration of a product within the substrate. It has to be pointed out that the weathered stone surfaces usually show an enhanced porosity compared to the freshly quarried material. Cracks, grain detachments and secondary porosity form as a result of the weathering after outdoor exposition . In the stone at work, the porosity shows a gradient from the bulk to the very surface of the material. The two marbles display a rather different state of conservation with respect to the deterioration patterns and the decay extent, being Candoglia generally better preserved than Crevoladossola. According to stone conservation standards [39, 40], the main deterioration pattern of Candoglia is erosion on areas exposed to rainfall, which show an increased superficial roughness of the substrate due to intergranular corrosion by calcite dissolution , as evaluated by on-site digital microscopy (Fig. 1a, b) and by ESEM analysis on micro-samples. Differential erosion in presence of quartz-siliceous veins (Fig. 1a) within the stone matrix is observed. On the other hand, the stone material sheltered from the rain is partly covered by dark deposits (Fig. 1c) and some biological colonization (Fig. 1b). The composition of the deposits evaluated by FTIR analysis includes calcium sulphate (as gypsum), nitrates, quartz and other silicates, and traces of calcium oxalate. Such composition is typical of sulphatic deposits and black layers developed in urban polluted environment [42, 43]. The state of conservation of Crevoladossola is characterized by the presence of a diffused colour alteration which is responsible for the current dark to light grey appearance of the originally white stone blocks (Fig. 1d). The altered blocks also show reduced granular cohesion so that mild mechanical actions on the surfaces result in grain detachments and powdering. The combined action of atmospheric corrosion and thermal weathering on the dolomitic matrix causes intergranular crack formation and enhanced chemical dissolution along the grain borders and the cleavage plane (Fig. 1e) [1, 44]. These last appear deeply corroded forming fissures and micro-cracks which can cross the grains almost up to their entire thickness (Fig. 1f). The cross-section observation (Fig. 1f) does not show the presence of a continuous superficial deposition; on the other hand, the surface discontinuities and micro-fissures appear partly filled by soil dust and particulate matter which can be responsible for the observed colour alteration. Given the previously discussed conditions, the most external and altered stone material has to be considered unstable and loss of material occurs as a result of the rain wash. Where the erosive mechanism is particularly active, namely along the borders and edges of the blocks, a remarkable surface recession is observed. In such condition, the resulting surface still suffers from granular disaggregation and it is characterized by a lighter colour due to the removal of the superficial altered stone material (Fig. 1d). The results indicate that despite some common initial features, the two marbles provided completely different durability at work. In particular, the worst conservative condition of Crevoladossola is also associated to a generally higher heterogeneity of the surface morphology with respect to Candoglia. The overall conservation strategy therefore has to be particularly focused on the former lithotype, which is also the most diffused in the façade. Among the issues to be tackled, it has to be considered the reduction of the colour alteration which will eventually reoccur after cleaning by slowing the rate of soiling. According to this objective, the self-cleaning activity of nano-TiO2 can provide a valuable contribution. The proposed treatments have been applied and tested on previously cleaned surfaces. In Fig. 2 the SEM analysis of the Candoglia (Fig. 2a) and Crevoladossola (Fig. 2b) after mechanical cleaning (micro-sandblasting) of the surface performed by the restorer are reported. The cleaning procedure on Candoglia marble was able to completely remove the deposits although the mechanical action of the selected inert increased the surface roughness (Fig. 2a). As a result, the overall grain texture of Candoglia is partly concealed and some cavities due to the inert impact can be observed at a microscopic scale. At visual observation, the cleaning of Crevoladossola surface has removed the external altered stone material. The SEM analysis confirmed this result (Fig. 2b) showing a substrate morphology which appears more compact compared to the weathered one (Fig. 1e). A reduced presence of intergranular cracks can be observed. Moreover, some dolomite grains are fractured by the mechanical impact of micro-sandblasting. A preliminary photographic documentation was carried out 1 month after the application of the treatments on the marble substrates. No relevant visual changes can be observed by naked eye, except for the areas treated with the commercial polysiloxane treatment (S), which show a slight surface yellowing compared to the untreated reference areas (NT). As far as the surface morphology is concerned, similar consideration can be drawn after on-site digital microscopy observation. The application of the commercial polysiloxane (S) causes the most significant modification of the surface appearance. The coarse-grained texture of Candoglia marble is partly obliterated as a result of the treatment and the typical grain-size heterogeneity is no longer visible (Fig. 3a, b). Moreover, a slight yellowing can be observed also at this level of magnification. 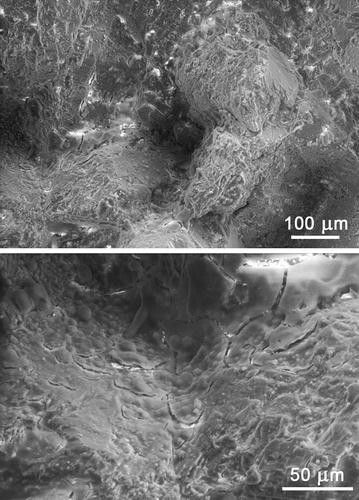 The microscopic images of the Crevoladossola highlight darkening and yellowing of the surface induced by the polysiloxane treatment (S) compared to the untreated area (NT) (Fig. 3c, d). ΔL*, Δa*, Δb* and ΔE* values measured after 1 month from the application are reported in Table 3. For both Candoglia and Crevoladossola marble, all the treatments show high colour compatibility since ΔE* values are always lower than the threshold value of 5 . For Candoglia marble, the area treated with the commercial polysiloxane coating (S) shows the highest value of colour change (ΔE* about 2.6), mainly due to the increase of b*, which corresponds to surface yellowing as pointed out by visual and digital microscopy observations (Fig. 4). The area treated with the functionalized SiO2-based nanocomposite (FSn) shows an intermediate behavior with respect to colour change, with ΔE* values of about 2 thus possibly perceptible by human eye . The colour change of FSn mainly derives from the increase of the L* values, which corresponds to a limited surface whitening probably induced by the presence of TiO2 nanoparticles. All the other treatments show very limited colour changes, with ΔE* values ranging from about 0.50 to 1, thus not perceptible by human eye . The initial post-treatment colour change values of Crevoladossola marble are generally higher than those of Candoglia. The highest ΔE* value is again achieved in the area treated with the commercial polysiloxane (S area, ΔE* = 3.46). Intermediate colour variation are displayed by the polysiloxane-based nanocomposite (Sn), the commercial alkylalkoxy-silane nanocomposite (CSn) and the functionalized SiO2 coating (FS), which show ΔE* values ranging from about 2 to 2.70. For CSn and FS colour difference is related to the decrease of the colorimetric coordinate L* and to the increase of b*, indicating that these treatments induce a moderate yellowing and surface darkening. The surface whitening occurred in Sn area, where the colour variation is mainly due to the increase of L* values, can be ascribed to the higher concentration of TiO2 nanoparticles compared to the other nanocomposites. In all the other areas (T, Tn, FSn) very limited to negligible ΔE* values are observed, ranging from about 0.40 to 1.2. ESEM-EDX analyses were carried out in order to study the surface morphology of samples collected from the treated areas on both marbles compared to the untreated ones, 1 month after the treatments. In both stones, TEOS (T) tends to form a surface layer of highly micro-cracked glass-like material due to the shrinkage of the SiO2 gel formation. The TEOS-nano-TiO2 treatment (Tn) shows a rather similar morphology due to the superficial SiO2 gel accumulation (Fig. 4). As far as the surface covering is concerned, the TEOS treatments on Candoglia marble homogenously cover the crystal grains whereas on Crevoladossola they preferentially accumulate along the grain borders. This can be related to the different state of conservation previously discussed. In particular, the higher degree of decohesion induced by weathering of Crevoladossola determines a preferential accumulation so that the covering of the grains is less uniform than Candoglia (Fig. 4). For what concerning the polysiloxane treatment, the addition of the nanoparticles induces a significant variation of the surface morphology. The commercial polysiloxane (S) on both stones penetrates into the crystalline matrix, forming a very thin layer which covers homogeneously the stone crystals (Fig. 5a–c). When TiO2 nanoparticles are added to this polymeric material, the surface morphology is altered, leading to the formation of a sponge-like layer covering the stone substrate (Fig. 5b–d). As a result, the original grain morphology is hardly detectable, differently from what occurs in the case of the polysiloxane alone. This is in accordance to a previous study by Atomic Force Microscopy  which highlighted an increased roughness as a result of the treatment which is induced by the nanoparticles emerging from the outer surface of the treated stone. The distribution of the nanoparticles in the areas treated with the polysiloxane-based nanocomposite (Sn) has been specifically investigated. The ESEM observation and elemental maps of the samples collected from Crevoladossola marble are characterized by a homogenous distribution of TiO2 nanoparticles in the polymer, as indicated by the simultaneous presence of Ti and Si all over the surface (Fig. 6). The commercial alkylalkoxy-silane nanocomposite (CSn) develops a rather thick surface layer similarly to the polysiloxane treatment (S), which does not significantly change the grain morphology despite the presence of the nanoparticles. The morphologies of both the functionalized SiO2-based coating (FS) and the functionalized SiO2-based nanocomposite (FSn) show similar features to those of TEOS (T) and TEOS-nano-TiO2 treatment (Tn) (Fig. 7). In particular, a similar glass-like and highly fractured layer can be observed homogeneously covering the stone grains of both Candoglia and Crevoladossola. 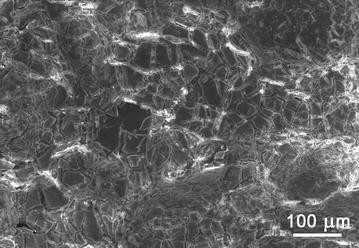 The nanoparticles are well distributed within the coating all over the treated surface, as confirmed by EDX mapping. Colorimetric measurements were carried out following a 3-month monitoring interval after the application of the treatments. The most relevant variation occurred shortly after the application (1 month) and after 1 year, therefore only this monitoring data will be discussed. It is worth noting that for both substrates all treatments can be considered compatible under the colorimetric point of view after 1 year from application, since all the colour differences values (ΔE*) are lower than the threshold value of 5 (Fig. 8). On Candoglia marble, the lowest colour variation occurred in the areas treated with TEOS (T) and the functionalized SiO2 product (FS), characterized by negligible ΔE* values (Fig. 8). An intermediate behavior characterized by ΔE* values lower than 2.5 was showed by the commercial polysiloxane (S), the commercial alkylalkoxy-silane nanocomposite (CSn) and the functionalized SiO2-based nanocomposite (FSn) (Fig. 8). The addition of nanoparticles to both TEOS (Tn) and polysiloxane (Sn) leads to the highest color differences (Fig. 8) after 12 months. It is worth noting that such variations are still acceptable. Generally, for all treatments containing nano-TiO2 (Tn, Sn, CSn and FSn) the global colour variation is mainly due to the increase of the lightness (ΔL*) indicating a slight whitening effect, as a result of the application of the nanoparticles on a substrate characterized by a typical pink colour (Fig. 8). Moreover, being Candoglia a very compact stone which is not particularly affected by decohesion phenomena in this specific case study, such colour alteration could also be related to the reduced penetrations of the treatments within the mineral matrix. The colour variations developed within the entire monitoring period, starting from rather low 1-month ΔE* values, and could be associated to a partial aggregation of the nanoparticles. This aspect should be further investigated by sampling and analyzing the long-term exposed surfaces. The colorimetric data obtained from the untreated reference area (NT) indicate that the surface colour does not undergo any significant colour variation along the entire monitoring period (Fig. 8). Previous laboratory test showed positive self-cleaning results for polysiloxane and functionalized SiO2 nanocomposites applied on stone specimens. By monitoring rhodamine B discolouration after Xenon-lamp irradiation a remarkable photocatalytic activity of the nano-TiO2-based treatments was found [29, 30]. In order to asses also on-site the actual self-cleaning properties of the nanocomposites a prolonged monitoring of the soiling rate on treated surfaces will be necessary. After 12 months, for Crevoladossola marble, the highest colour compatibility (ΔE* below 1) was obtained from areas treated with TEOS (T), TEOS-nano-TiO2 treatment (Tn) and functionalized SiO2-based nanocomposite (FSn) (Fig. 9). ΔE* values lower than 2.5 were obtained in areas treated with the polysiloxane-based nanocomposite (Sn), the commercial alkylalkoxy-silane nanocomposite (CSn) and the functionalized SiO2 product (FS) (Fig. 9). The polysiloxane product (S) leads to the most significant color change due to surface darkening and yellowing (Fig. 9). As previously discussed for Candoglia marble, the untreated reference area (NT) showed negligible colour change (Fig. 9). It can be observed that compared to the Candoglia data, all treatments on Crevoladossola are more stable over time considering the global colour variations measured after 1 month and at the end of the monitoring. Moreover, it seems that both L* and b* coordinates contribute in a comparable way to the global colour variations. The nano-TiO2 based treatments (Tn, Sn, CSn and FSn) in this case are not associated to lightness increases due to superficial whitening as previously observed on Candoglia. This can be correlated to the different substrate condition provided by Crevoladossola: an overall more neutral whitish colour respect to the pink hue of Candoglia and a more pronounced granular decohesion which influences the distribution and penetration of the treatments. It can be observed that generally the application of all the commercial treatments (T, S and FS) results in a slight superficial darkening, due to the increased colour saturation of the substrate, and yellowing (Fig. 9). The addition of the nanoparticles to the treatments (Tn, Sn and FSn) is able to reduce such effects in all cases and this is particularly evident for the polysiloxane nanocomposite. Under the colorimetric point of view, the nanocomposites therefore display better compatibility results with respect to the associated commercial products. The on-site evaluation of the water absorption properties is a crucial yet complex task in order to assess the performance of stone surface treatments. The water absorption monitoring has been assessed by the contact-sponge method, following previous studies conducted both in the lab and in situ [47, 48]. Figure 10 reports for each area the ratio between the values of water absorption [Wa(t) (g/m2s)] measured after 1, 7, 10 and 12 months with respect to the value measured before the application of the treatments [Wa(nt) (g/m2s)]. The untreated reference area (NT) is also reported as control, being such measurement highly affected by the environmental parameters in outdoor conditions (T and RH). For this reason, the data obtained in winter season after 4 months are not reported since the high level of humidity and very low temperature were rather far from the average environmental conditions of all other monitoring intervals, hence water absorption is inhibited (Table 4). The untreated reference area (NT) results were constant along the monitoring period indicating that this method can provide consistent information, while the rather high data dispersion is due to the inherent surface heterogeneity. Considering the entire monitoring period, the highest reductions of the water absorption are measured in the areas treated with the commercial polysiloxane (S) and the polysiloxane-based nanocomposite (Sn). The stone surfaces treated with the functionalized SiO2 (FS) and functionalized SiO2-based nanocomposite (FSn) show a significant reduction of water absorption, but slightly lower with respect to the polysiloxane-based treatments (Fig. 10). A reduction in water absorption occurs also in the areas treated with TEOS (T) and TEOS-nano-TiO2 treatment (Tn), even if they should not display water repellent properties (Fig. 10) [49, 50]. This can be related to the specific characteristics of such treatments applied on marble, which are able to partly fill the pore space and the micro-cracks of the weathered material. As a result, the improved cohesion of the stone matrix is less prone to water absorption. This effect is slightly reduced in the area with TEOS-nano-TiO2 treatment (Tn) with respect to the one treated with TEOS (T), due to the hydrophilic behavior of nano-TiO2 . Notwithstanding having a similar surface morphology with respect to the functionalized SiO2 products (FS, FSn) (Figs. 4, 7), the less effective water reduction of the TEOS-based ones are due to the absence of water repellency properties, as previously discussed, and to the less homogenous coverage of the grains, as observed by ESEM (Fig. 4). The results indicate that the innovative nanocomposites applied on-site on real stone surfaces showed comparable results with respect to the commercial products, therefore the nanoparticles addition does not negatively influence the water absorption reduction properties. After 1 month from application all treatments reduced the water absorption. The results obtained after 12 months monitoring, also indicate that the stone surfaces maintained their water absorption reduction properties over time, except for the area treated with the commercial alkylalkoxy-silane nanocomposite (CSn). This last shows a progressive increase of the water absorption to be probably ascribed to the alteration of the coating (Fig. 10). Further investigations will be carried out in order to better understand the behavior of this treatment. The protection of low porosity stones, as marbles, from atmospheric deterioration is challenging and scarcely documented in literature in terms of evaluation of the performances of conservation treatments exposed to real conditions. 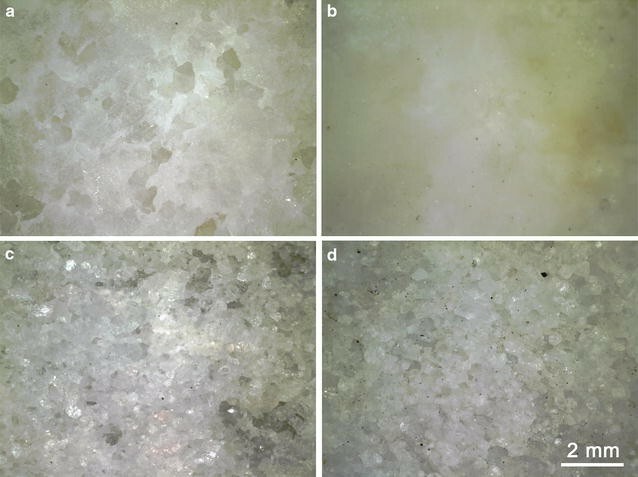 The application of both commercial and innovative treatments based on TiO2 nanoparticles on pilot-areas of the façade of Monza Cathedral provided information about the behavior of selected treatments on two substrates characterized by different chemical and mineralogical characteristics and conservation state: Candoglia and Crevoladossola marble. First of all, the variability in the amount of applied products resulting from the same application methodology is due to several and unavoidable factors: the substrate porosity and state of conservation, and the specific physical properties (viscosity, surface tension) of the products. Colorimetric measurements performed on each area after the treatment and over a 12-month period from the application indicate a good compatibility of all treatments, with ΔE* values always below the threshold of 5 units. All treatments characterized by water repellency properties (S, Sn, CSn, FS, FSn) succeeded in reducing the water absorption of Crevoladossola marble, and four of them were able to maintain such properties within the 12-month period of the monitoring; the commercial alkylalkoxy-silane nanocomposite (CSn) is the only one which partially lost its efficiency. Further investigation in the lab will be carried out to understand this behavior. A promising result is the fact that the addition of the innovative TiO2 nanoparticles did not affect the water absorption characteristics of both the polysiloxane and the alkylalkoxy-silane treatments during the outdoor exposition, and that these nanocomposites granted a good performance in terms of aesthetic and protection properties. Besides that, the presence of nanoparticles is expected to provide photocatalytic activity that would reduce the soiling rate and deterioration effects related to the presence of inorganic and organic pollutants, as already assessed during previous laboratory testing. The positive results obtained by these treatments can also be ascribed to the morphology they developed on both stones, namely the good covering of the crystalline matrixes and the rather homogeneous distribution of TiO2 nanoparticles. The obtained data highlighted once more the complexity of field exposure tests on real surfaces of the architectural heritage. They also confirmed that a longer on-site monitoring activity of at least 3–5 years should be carried out in order to properly assess the performance of the surface treatments. Nevertheless, the results of the study will be used for the selection of the treatments to be applied in the framework of the overall conservation project of the façade of the Monza Cathedral, and will be a solid reference for future experiments with nanocomposites for the protection of marbles. FG and DG conceived the study, performed the analyses, carried out the interpretation of the results and drafted the manuscript. AC synthesized the TiO2 nanoparticles for the preparation of the innovative formulations and critically reviewed the manuscript. SG and LT supervised the activities, the analysis of the data and critically reviewed the manuscript. All authors read and approved the final manuscript. This work has been supported by “Parrocchia di San Giovanni Battista-Duomo di Monza” and by the European program Horizon 2020 Call NMP21-AC 646178, in the framework of the Nano-Cathedral project (Grant agreement 646178). The Authors wish to thank the restorer (Arterosa Restauri, Italy) for the support in the preparation of the surfaces.